Despite what the App Store says, this app does not support Spanish. A quote from their tech support, “Only the buttons are in Spanish and Portuguese. The tour is English only. If you want to see the buttons in Spanish or Portuguese you have to change your phone’s language to Spanish or Portuguese.” I’m not sure how anyone would consider this as supporting Spanish. So happy we purchased this app. 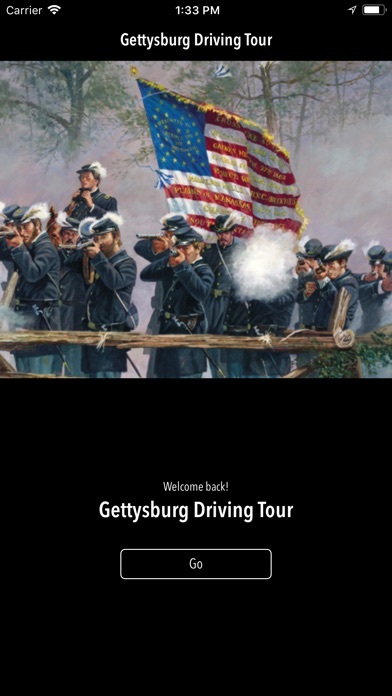 It brought the town of gettysburg and the battlefields to life. You can buy the $30 version from the gift shop OR you can buy this one and have money left for lunch. This app was great. 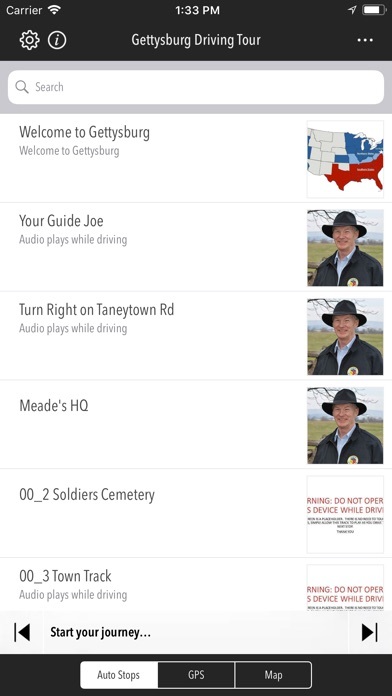 The narration and embedded videos are awesome, and the gps function worked flawlessly. 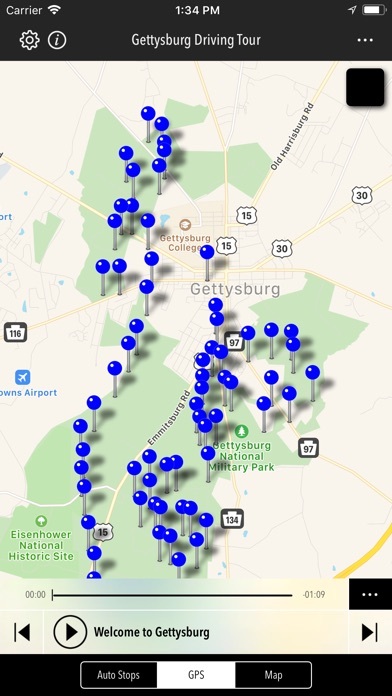 Our family of six had a great time learning history on the Gettysburg battlefield. Five stars. 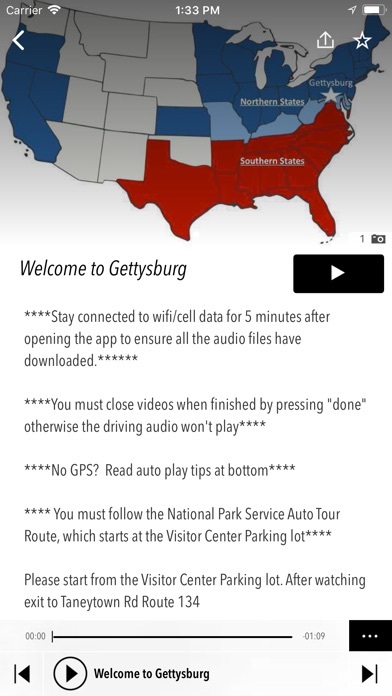 This was a fantastic app that took you on the audio tour of Gettysburg. It has a few videos too. Loved the GPS feature. Well worth the $! Doesn't work correctly with iphone 8's plus running iOS 12.1.4. 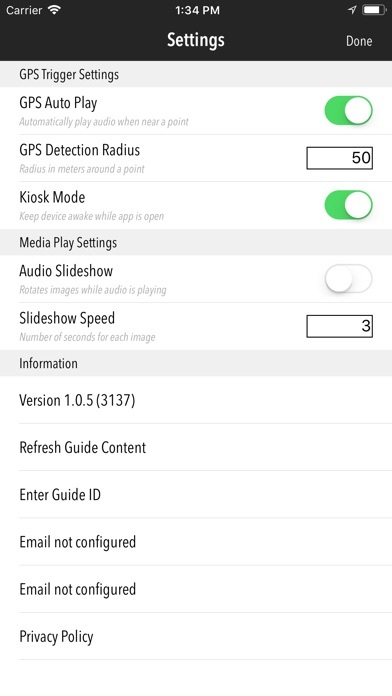 Settings screen display is "overlapped" and locked, no changes can be made, and feature where app tracks you on the battlefield doesn't work. All in all, a waste of my money, & very disappointing. I recommend buying a guide book-they always work!! Great app. This hits the highlights of the battlefield tour at Gettysburg. The family enjoyed the content. YouTube links and music were great. We will continue to use this tour with friends coming in from out of town. Make sure you allow locations always. Next, cell service can be a little spotty in such a rural area, but that is not the fault of the app. Turn on the app and head to the first stop. The map from the visitors center and this app made a enjoyable tour. Just a little short of perfect. It was rough to find out where to start. We ended up just doing the last 5 parts and giving up. Great idea, with a little more work, it’s a wonderful idea. Tried using the app on our tour. Followed the instructions on how to use it, but the app never worked properly. Ended up using the auto tour CD from 30 years ago. At least that's reliable. Did not work, the markers wouldn’t play. No instructions, or clear way to use the app. It kept repeating the same fact and telling me to press the overview button which did not exist. Might as well have just set $10 on fire. Total waste of money.